Kermit Gosnell abortion trial: Conservatives took to Twitter to shame mainstream media into covering the Philadelphia abortion clinic trial. How conservatives used Twitter to goad the media into covering the trial of abortion doctor Kermit Gosnell. 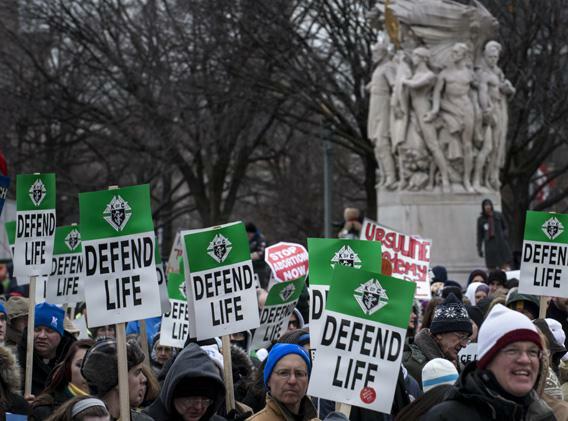 Pro-life activists march during the March for Life Jan. 25, 2013 in Washington, D.C. It started with a Twitpic. By April 11, the PhillyBurbs.com columnist J.D. Mullane had spent weeks watching the trial of abortionist and accused murderer Kermit Gosnell. Mullane had tweeted links to Gosnell trial updates from LifeSiteNews.com, and links that suggested a biased media was ignoring the trial—“Guns and babies: A tale of two massacres.” He’d sparred with pro-choice tweeters. “What went into Gosnell’s red waste bags was no different that what goes in the waste at any Planned Parenthood clinic,” he’d said to another suburban columnist. “What happens at Planned Parenthood clinic is legal, safe,” said the columnist, Kate Fratti. “It’s not safe for the children snuffed,” said Mullane. Can you imagine the media reaction if the case were reversed and it was a pro-lifer on trial for 7 counts of 1st degree murder? Exactly. We are going to make “new media” work on behalf of Kermit Gosnell’s innocent, helpless victims. The mainstream media is acting like nothing is happening, however—if we unite & spread the word far enough, we can FORCE the media to cover this horrific story. It worked. An estimated 106,000 #Gosnell tweets later, on April 15, Mullane reported that major networks and newspapers had sent their reporters to cover the trial—Fox News, the New York Times, the Washington Post. Hours later, after bombs went off in the last leg of the Boston Marathon, hopes of pushing this to “the front page” waned. But in between the Twitpic and the breaking news, there’s a lesson about how conservatives can use social media—and only social media—to move the press. It didn’t cross over. There were scattered media reports on the trial, and plenty of Philadelphia-area coverage. Some magazines—Slate included—had covered the Gosnell case two years earlier, when a grand jury report of remarkable, grisly detail was put out by the city. But there was no camera in the courtroom, and news organizations didn’t feel any pressure to cover the story. Thus: Twitter. The single most effective campaign to goad the media into Gosnell coverage came from Mollie Hemingway, a press critic for the blog GetReligion. Hemingway did not wait for reporters or editors to comment on the story; she didn’t email them and wait for comment. “Inspired by Kirsten Powers’ USA Today column,” she tweeted at them, then recorded the unanswered tweets for readers, starting the experiment with Associated Press social issues reporter David Crary. “His favorite stories deal with homosexuality,” wrote Hemingway, “but he also gives some love to abortion-related stories.” Just not to Gosnell. This was a warm-up: Hemingway found a reporter who could personify that photo of the empty court benches. She tweeted at Sarah Kliff, the health care policy reporter for the Washington Post’s WonkBlog subsite. WaPo health policy reporter @SarahKliff has 80+ site hits on Akin/Fluke/Komen and zero on Gosnell? Would love an explanation. Why did this work so well? Not long ago, the preferred method of browbeating the media into covering a story was “melting the phones,” or deluging a reporter with emails. Why were tweets and Twitpics so much better equipped to turn on the shame-rays? Easy: It’s completely public. It’s a limiting medium, too, one that limits a reporter’s response to 140 characters. That’s excruciating for a member of the fourth estate; I once ticked off a longform magazine writer and got a five-paragraph email demanding that I tweak one sentence describing his article. There’s no real entry fee to Twitter, no difference between the user with 40 followers, the media critic with a question, or the TV anchor who wonders where this hashtag came from. Almost every factor that elevated the #Gosnell story was present for the Trayvon Martin story. That’s not comparing the facts of the cases; that’s just saying, the hashtag knows no mercy. Neither does the news cycle. By Monday afternoon, the media trend-spotters who’d rediscovered Gosnell were combing Twitter for Boston Marathon survivors and witnesses. In the Philadelphia courtroom, surrounded—maybe temporarily—by the national press, Mullane was eyed warily by a bailiff.